And other takeaways from his interview with Axios. SpaceX CEO Elon Musk doesn’t just want to send people to Mars — he plans to travel to the Red Planet himself. 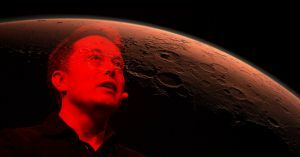 He’s not just planning to visit the planet, either — “I’m talking about moving there,” he told Allen and VandeHei. Your probability of dying on Mars is much higher than Earth… It’s gonna be hard, there’s a good chance of death, going in a little can through deep space. You might land successfully. Once you land successfully, you’ll be working nonstop to build the base. So, you know, not much time for leisure. And once you get there, even after doing all this, it’s a very harsh environment, so you, there’s a good chance you die there. We think you can come back, but we’re not sure. Mars wasn’t the only topic Musk talked about during the Axios interview. He also discussed his neuroscience company, Neuralink, noting that its long-term goal is “to achieve a symbiosis with artificial intelligence,” which he asserts is an “existential threat” to humanity. And of course, no Musk interview would be complete without mention of Tesla.